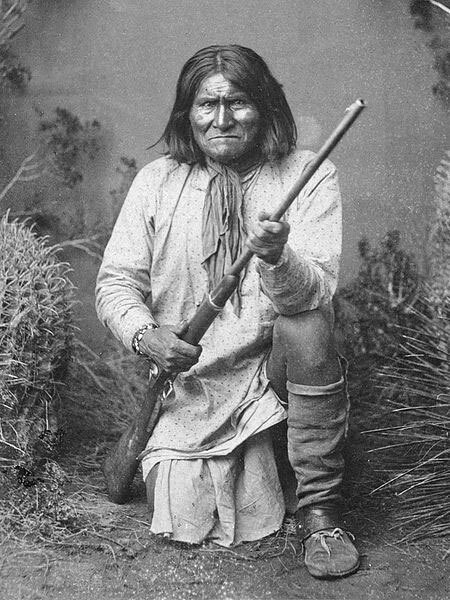 Geronimo was born in June 1825, in present day New Mexico, near the confluence of Turkey Creek and the Gila River. Geronimo was a Bedonkohe Apache. His father Taklishim, was a Chiracahua and his mother Juana was held captive by Mexicans during much of her childhood. Geronimo married Alope, a girl from the Nedni-Chincahua Apache band, when he was just 17. They had three children together. Geronimo was not a hereditary chief, he earned his was by showing valor on the battlefield. On Mach 6, 1851, Geronimo and his men were away from their village trading with other tribes. They left sentries in charge of security, but they were overwhelmed by 400 Mexican soldiers. Geronimo would return to find his entire family dead, and everything that that his people owned was either gone or destroyed. Their entire encampment was wiped out. In 1874, soon after the death of Cochise, the Chiracahua began raiding Mexico with greater frequency. They were using the reservation at Apache Pass as a safe haven. The government stepped in and closed the reservation and they moved everyone to the San Carlos Reservation. At this time there were already 4,000 Apaches at San Carlos. However, Geronimo had other ideas. He joined other renegade bands in the Sierra Madre Mountains of northern Mexico. From here the carried out raids on the American side of the border. He was finally captured by the Chiracahua Indian agent in April 1877, and returned to the San Carlos Reservation. In 1881, an Apache prophet named Nakaidoklini led a new Native American religious movement. He and his followers believed that dead warriors would be resurrected and that they would defeat the whites. The U.S. Army attempted to arrest Nakaidoklini. They caught up with him at Cibecue Creek, and in the ensuing battle he was killed. After the battle, Geronimo, Naiche (son of Cochise), and Chato, the hereditary leader of the Apaches joined 74 of their followers, and fled to Mexico. They would return to the San Carlos Reservation and kill the chief of police, and take scores captive. General George Cook was ordered to go into Mexico and apprehend the Apaches. The U.S. Army struck them hard before they agreed to give up. Then in 1864, the government moved to ban the Apache alcoholic substance called tiswin. Again, Geronimo and 150 of his warriors fled the reservation for Mexico. General Cook's men caught up with them at Canyon de Embudos on March 25, 1886. The fugitive Apaches surrendered after agreeing to accept two years in prison. On their way to the prison at Fort Bowie, Geronimo and 23 of his men escaped again. This time they were pursued By General Nelson Miles and 5,000 soldiers. After a month of dodging the U.S. Army, Geronimo and his men turned themselves in to authorities. Geronimo was never again allowed to return to his homeland. Geronimo and hundreds of the Apaches were transported to Fort Pickens and Fort Marion in Florida. Eventually, he would end up at Fort Sill, Oklahoma where he would die on February 17, 1909.